Horsepower ~ Fancy Hats ~ Southern Food & Fellowship, all part of what make the Kentucky Derby one of the most unique events in the U.S. Join the Bedford County Chamber Foundation for all the fun and exhilaration of the Fastest Two Minutes in Sports, as we gather for the 2nd annual Kentucky Derby Lawn Party - Saturday, May 4th at Diamond Lane Horse Farm in Baker's Summit. Gather at 4pm for appetizers, lawn games, a fancy hat contest, music, raffles and small games of chance (no betting) and much more... all leading up to a broadcast of the race! Dinner at 5:30pm as the horses go to post, then root them down the stretch and on to the Winner's Circle! Diamond Lane is home to champion Percheron Horses - weather permitting, horse-drawn carriadge rides will wrap up a great day to benefit the 501-c3 Bedford County Chamber (Education) Foundation. 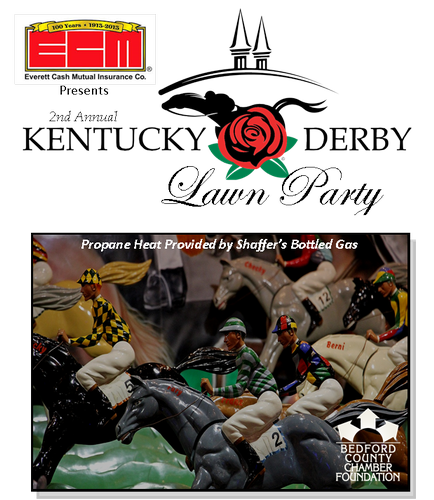 Join us for this tented lawn event (rain or shine) with heat, if needed, provided by Shaffer's Bottled Gas. Directions from Bedford: I-99 North to Claysburg exit - turn right and go over Sproul Mountain. Turn right at the "T" in the road/stop sign onto Lafayette Road/PA 867. Take the first left onto Evergreen Lane. Parking is in the lot just before you get to the tent/barn at Diamond Lane Farm. Sponsorships including table reservations are also available.